Continuation of mixed media, found-object sculpture/constructions begun in 2008. 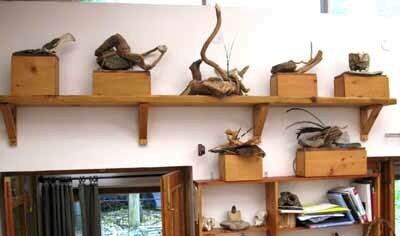 They combine carvings with natural (wood, bone, feathers, stone, quills, etc.) and man-made (metal, plastic, cloth, rope, barbed-wire) objects. These totems are contemporary expressions of the early tribal concept in which signs and symbols were created (carved, painted, etc.) to represent spiritual of natural forms. Some convey concerns about desturctive human environmental impacts that are occuring worldwide.